I love old letters. I love the colors acquired in old paper. I love the forthrightness of the old brown ink. 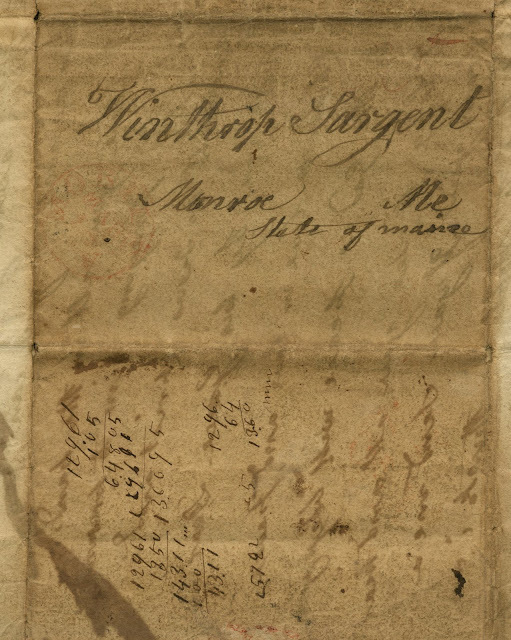 The letter above was written by my great-great-great-great grandfather back in 1831. He had hit on some hard times, and had gone to Alabama for work at the age of 61. It's an amazing thing to hold a document that a family member wrote 177 years ago. And such amazing handwriting people had back then. That's a dying art I'm afraid. What a rich family history you have! Dixie, I love old letters too. My aunt recently gave me a dusty strongbox filled with old old family letters and papers. There's a dance card of my grandmother's when she was a girl in the 20's and lots of old photographs, letters and documents. Amazing how much the world has changed in just a couple of generations. What would they think if we could show them around our world? To be able to hold and read such a remarkable link to the past is fascinating Dixie. He wrote with a strong hand did he not? A sign of wisdom and devotion. Thankyou for sharing a wonderful piece of history.